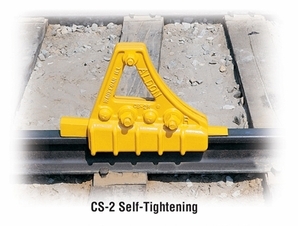 Wedge holds bolted-together car stop to rail. Stop stands 15 inches above rail. Can be used as chock as well as stopping device. Tighten bolts periodically and re-hammer wedge if loosened. Car stop is assembled on head of rail by tightening 5 bolts and driving wedge from the rear. Weight 107 lbs.